Getting your dog to ‘Heel’ is not so much a trick itself, but more of a way for your dog to behave. When walking your dog, their excitement can usually get the better of them and they will often steam ahead, pulling you with them. You are the pack leader, therefore you should lead the direction in which you go – the dog pulling on the lead should be discouraged. The use of ‘Heel’ in everyday dog walking is an essential dog walking behaviour to introduce to your dog as it gives you control. A dog by your side is considerably safer to himself and to others, than a dog bounding off in front. To teach your dog to Heel, and encourage it when walking you will need a standard leash and not a ‘flexi’ elastic lead. You also won’t really need treats for working ‘Heel’ into your dog walking behaviour as it will often distract the focus from getting the two of you to walk right. ‘Choke Chains’ are available for sale and are made for ‘training’ dogs to not pull on the lead. The collar itself has inward facing spiked prongs which dig into the dog’s neck when It pulls too hard. Under no circumstances should this be used as the practice does nothing in the benefits of training. ‘Slip Collars’ are made from a looped metal chain in the form of a noose type slip-on collar. When the dog pulls, the noose tightens and creates an unpleasant experience for the dog while walking. Just like choke chains they are unnecessary for most dogs and their use for training is debatable. For most training their pet, a collar of this type will not be required. If you have purchased an item such as this from a pet store you should return it and exchange it for a regular collar, harness and lead as they will be sufficient. When out walking and holding the leash at the handle, run your free hand along half of the length of the leash and draw it across your body so both hands have a hold on the lead. Your dog should try and pull ahead, but this handling of the lead means that their free reign is limited to following you at your side. If they pull give a light, but firm, tug on the leash with the hand holding half way down the leash. Use the command ‘Heel’ with the tug. Continue to do so until the dog stops pulling. Distractions will be everywhere on the street and your dog will often forget itself and continue to try powering forward. Repeat the ‘Heel’ command however times necessary. Eventually, whilst you hold the lead as instructed, your dog will stop fighting to run in front and will stick to your side. Dog training can be frustrating. Never show your frustration or take it out on the dog. He won’t understand and the frustration in your voice can actually be harmful and hinder the learning process of the command. If you feel like he’s just not getting it, leave it for the day and try again tomorrow. Choke Chains or Slip Chain Collars should never be used as they can be counter productive. 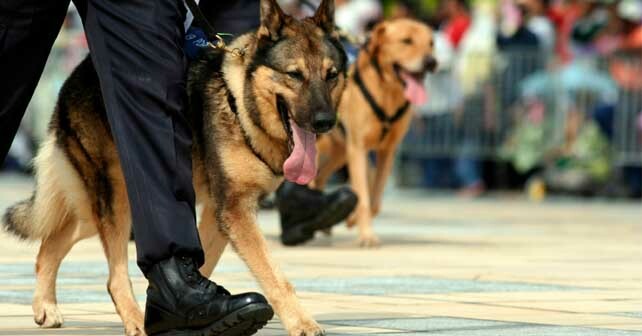 A dog will respond better to training with a regular collar and harness.